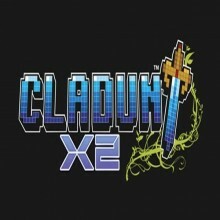 ClaDun x2 is more than just a sequel to ClaDun: This is an RPG!. It brings more than just a new story and new skills. There are new classes, new titles, an entirely new weapon system, new traps, new monsters. The core gameplay is very similar, but it’s definitely different, and for the better. To progress through the game, you go through dungeon floors until you get to the end of the stage, which advances the story (sometimes) and allows access to a new dungeon. Each floor is different, each one has a different time goal, each one has different properties. Some of them will be a puzzle with switches and gates that open and close, some you have to defeat a certain enemy or group of enemies, some are mazes with traps. Each dungeon has a theme, and its own personality, and it’s pretty awesome to see that no dungeon really feels the same. As you progress through the initial stages, you unlock more features of the game itself such as Hiyo’s ship, Ran-geons, shopping, and other things. The game still focuses on magic circles and swapping who is the main hero and who is the sub hero in order to gain a decent stat spread to build powerful heroes. Each magic circle has different places you can put heroes in, and each spot has different attributes that you can assign artifacts to which change your stats and can make your spells/abilities stronger, or help you run faster. Characters that level as the main hero gain a lot of HP and mana, while characters that level as the sub hero gain a lot of attack, defense, and SP. Another new aspect to the game is sorcery. If you apply a sorcery artifact to an ability slot, you can unlock forbidden magic that, while powerful, can go very wrong. There’s a lot more depth to this game than its predecessor, and overall this game is just a lot more polished as well. New to the Ran-geons is the Tri-geons, which is basically 3 different Ran-geons that you do at once. It’s pretty ridiculous to think about, but it’s a lot of fun. The first game had three weapon types, swords, clubs/axes, and staves. This game has Swords, clubs/axes, spears, bows, daggers, and staves. Each weapon is suited to a different situation, and they all have their strengths and weaknesses. Weapon skills return, and there are a lot more of them than in the previous iteration. There are more spells as well, and as you change classes you keep the skills you have, and get the opportunity to learn more. Titles have also changed drastically. Now you can take the titles that are found on weapons, and stockpile them. Once you have enough, you can apply them to a weapon, armor, or shield of your choice, which allows you to really customize your equipment and make it a lot better. All the editing from the previous game remains as well, and overall there is just a huge wealth of customization and content, delivered in a really slick package. Honestly, this is a really fun game. There are some frustrating times but there’s always a way to get stronger, whether it’s grinding a Ran-geon or by grinding away at some of the easier levels and then changing classes. There is a lot of depth and a lot to master in this game, and overall it’s a really strong addition from NIS to the PSP library. The Witch and the Hundred Knight launches March 2014 in North America and Europe!